So far, my best friends have been made in high school and in college. These are the people I know will be in my lives forever, the ones my kids will refer to as aunts and uncles. The difficult part of developing these deep friendships during this time, is its a pre-root time period. My friends scattered across the US for college, and even more after college. As we all graduated from college some stayed and some left. As we moved onto our adult jobs and adult relationships, adult roots also began to take hold. Nick and I ended up settling near the areas we grew up. Luckily, some of our good friends decided to do the same, but some others opted for new scenery, 3,000 miles away. One of our dearest friends is a friend we each met separately before Nick and I began dating. I knew Jared in high school. Although our friendship didn’t develop until our senior year, we quickly began hanging out in the same group of friends and got to know each other better. Jared was my senior prom date and we ended up attending the same college. I always felt comfortable with him and could talk to him easily. I was excited to have such a dear friend be a part of the next journey in our lives. Nick lived on the same hall as Jared freshman year. The tiny UGA dorm rooms forces students to spend more time hanging out in the hallways and spilling into hall-mates rooms. Jared and Nick hung out more and more as the year continued on, they kept in touch sophomore year after moving into apartments, and ended up living with each other the last few years of college. Nick and I began dating our sophomore year of college after meeting at a party at Jared’s apartment. With Jared being such a huge part of both of our lives, it was inevitable that the three of us would spend a lot of time together. When I think back to college I always think of Nick, Jared, and Elly (my other dear friend who also moved to LA. You can read about the visual journal page I used to process my feelings about that move here). It wouldn’t have been college without them. After college Jared and his girlfriend, Ashley, moved to LA (very much against the will of Nick and I). We were both sad to see them go, but excited for their new adventure, on what felt like another planet. Every year, at the very least, Jared comes home for Christmas. This particular year, we decided to meet up and do some stereotypical Atlanta tourist things: visit the World of Coke, the Atlanta Aquarium, and eat at a downtown restaurant. The three of us spent the day together gallivanting the city, and it felt like not a single day had passed since we graduated college. That was when I knew no matter the distance or length of time between catching up, we would always be friends. 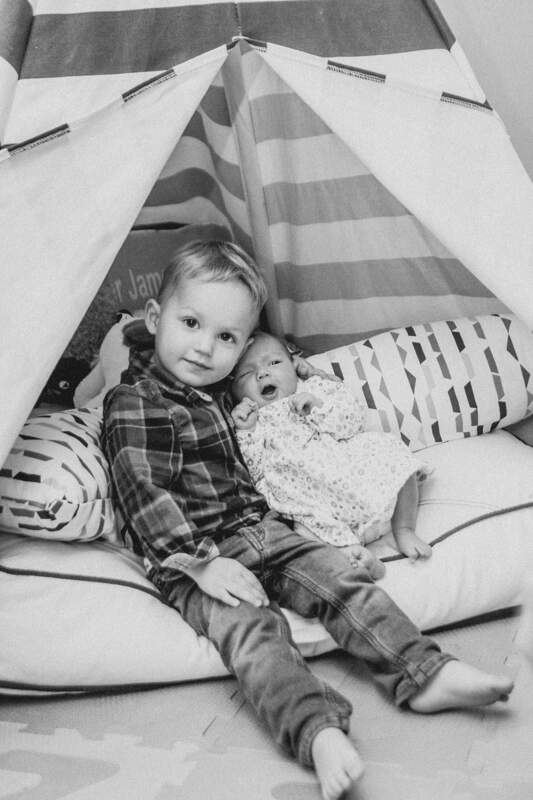 Jared and Ashley are now the godparents of our first born, little man Cooper. Now they are forced to be a part of our lives forever (a very selfish, calculated decision on Nick and my part). The best friends are the ones that feel like they never left when they move far away and come back and visit. One of my favorite parts of that day was looking at the jellyfish at the aquarium. I decided I would focus on that as the visual for the page. 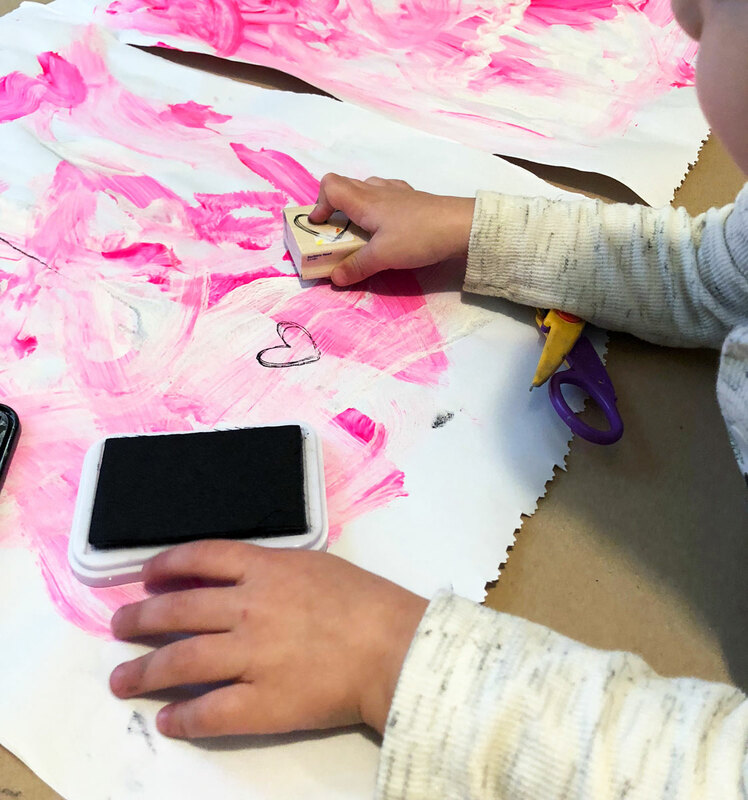 I recently began playing with bubble paint prints, was slightly obsessed (check out my visual journal worksheet on making bubble paint prints here), and this would provide another way for me to use them. I wanted to paint the background blue and green, so I ripped two pages out of my visual journal, painted them, then set them aside to dry. By ripping the pages out and gluing them back in, it prevents the paint from bleeding through the paper onto other pages. While the background was drying, I working on painting the jellyfish. I looked up a few pictures to reference, then loosely painted them. I kept the colors warm, to contrast the cool background. Once they dried, I cut them out. Once the background dried, I added the white bubble paint prints on top. To do that I took a shallow dish, added white acrylic paint, water, and dawn soap. I mixed it together, then used a straw to blow bubbles. Once the bubbles were just over the rim of the dish, I lightly placed the background paper on top, causing the bubbles to either stick to the paper or pop on the paper. I popped any bubbles that stuck to the paper after lifting it. The white coloring in the bubbles created a print of the bubble shape on the paper. 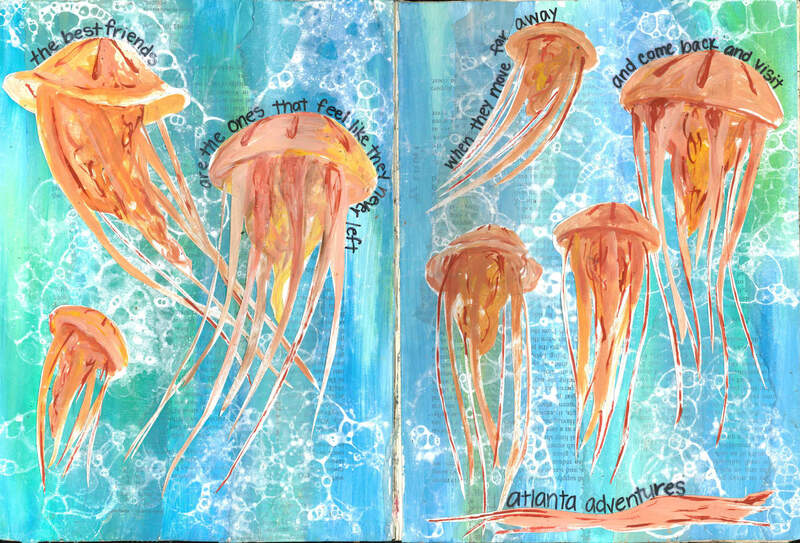 After the bubble paint prints dried, I glued the pages back into my visual journal. I simply glued them on top of the next two pages of my book. Next, I glued the cut out jellyfish paintings down. Last, but not least, I added the words using sharpie. Create a visual journal page about an important person in your life. 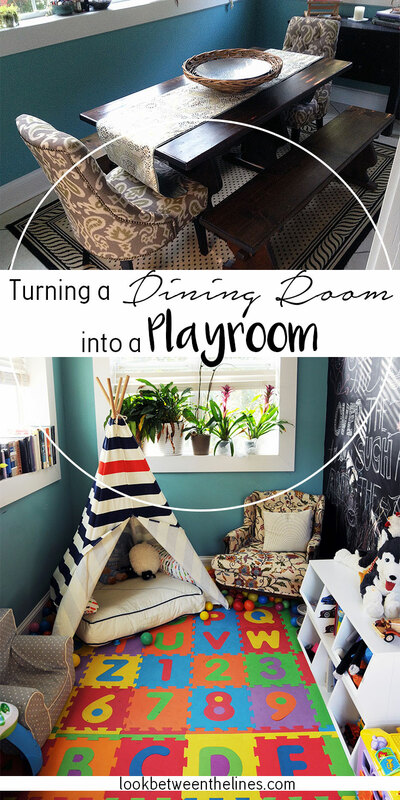 Thanks for taking the time to check out my blog and read today’s post! Help me spread the word about visual journals by sharing this post with others. If you are interested in teaching visual journals to your art students, check out my visual journal handouts here and yearlong lesson plan pack here. Would you like more visual journal how tos delivered straight to your inbox? Become a subscriber: fill out your e-mail address in the form at the bottom of the page. Thanks for stopping by! This year is the first year Cooper gets to celebrate Valentine’s day at school. Last year, as a one year old, he was a little too young to participate in the festivities. But this year, he gets to exchange valentines in the big kid room. 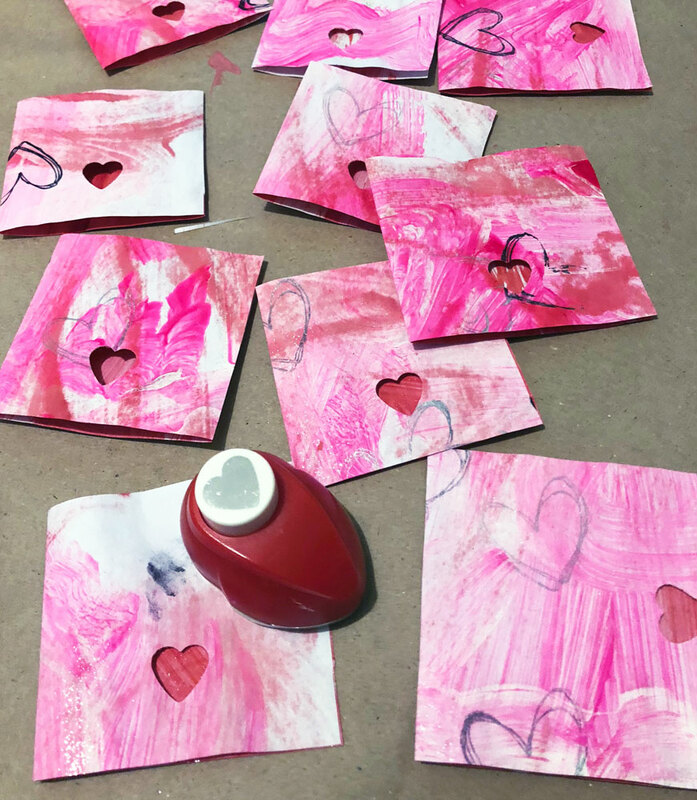 We were asked to bring in 19 valentines to exchange with all the students at his daycare. I decided while he is still young enough to not have an opinion about what valentines to bring, we would make our own. Plus the art teacher/mom in me thought it would be fun to have a craft project over a very rainy weekend. We started by using the easel he got for Christmas. I limited his color choices to pink, white, and silver, gave him two brushes, and let him go to town. I did encourage him to cover the entire page, but other than that, this was 95% Cooper painted. I decided to use the paper that came with his easel since it was large and already attached to the easel, but if I could go back I would’ve used a thicker paper instead. 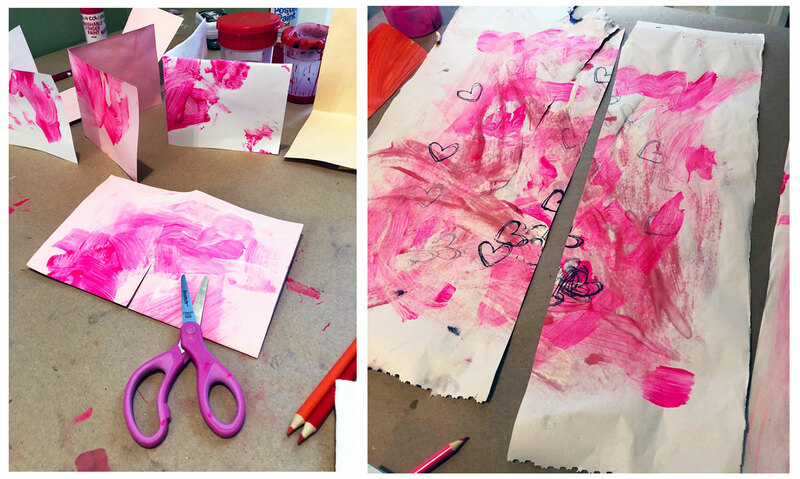 We painted two large sheets of paper using pink, white, and silver, then let them dry overnight. The next day we flipped them over and painted the back of the sheets with red and glitter red paint. I was much smarter first time around, having Cooper paint without a shirt on. I forgot to take his very white shirt off before painting with very red paint. 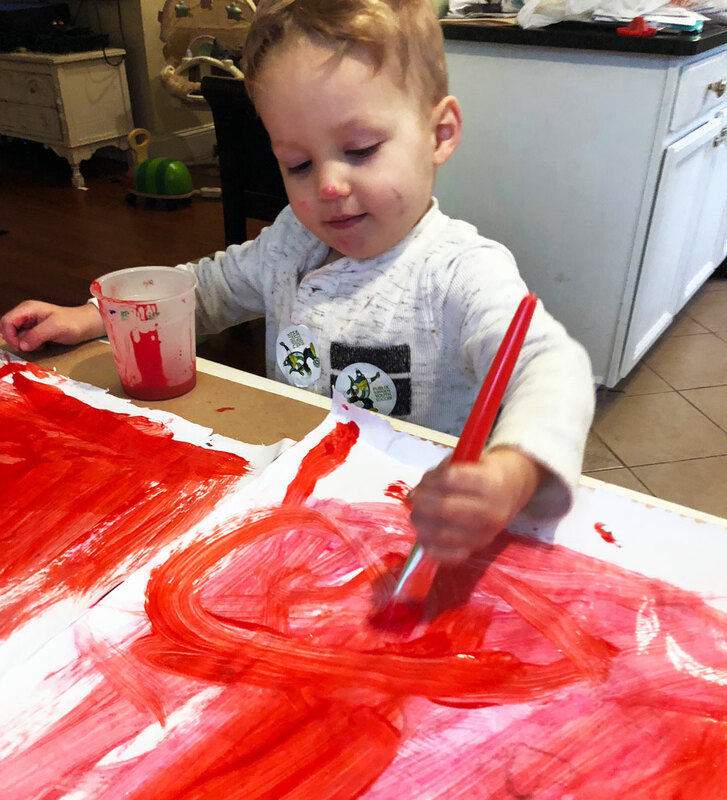 Luckily, we were using washable paint, so the paint that inevitably ended up all over his shirt came out after just one wash.
After we finished painting and the paint had dried, we started adding some other decorations. 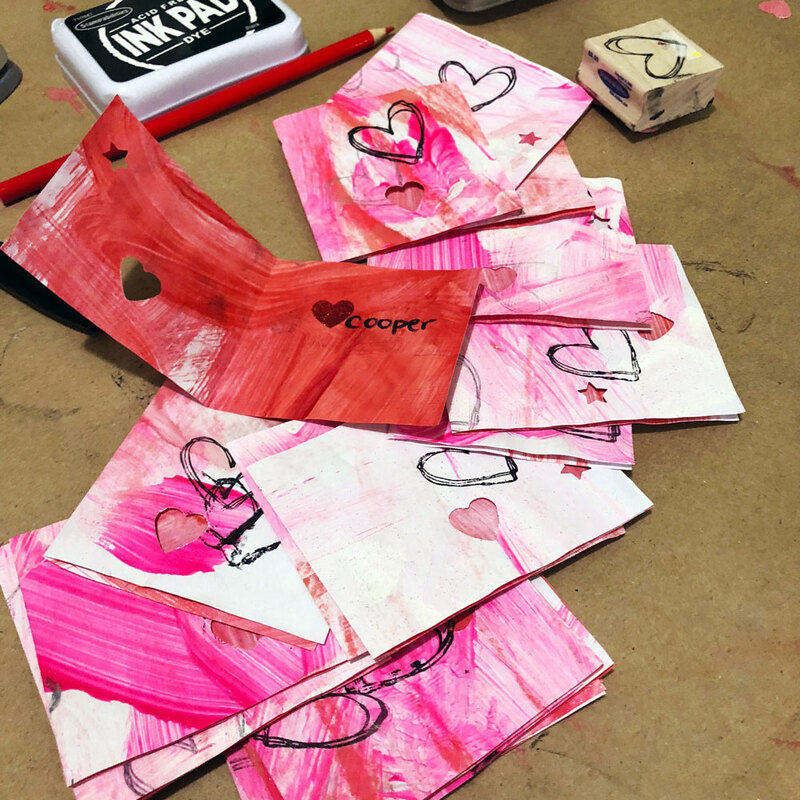 One of Cooper’s favorite parts was stamping with the heart stamp. 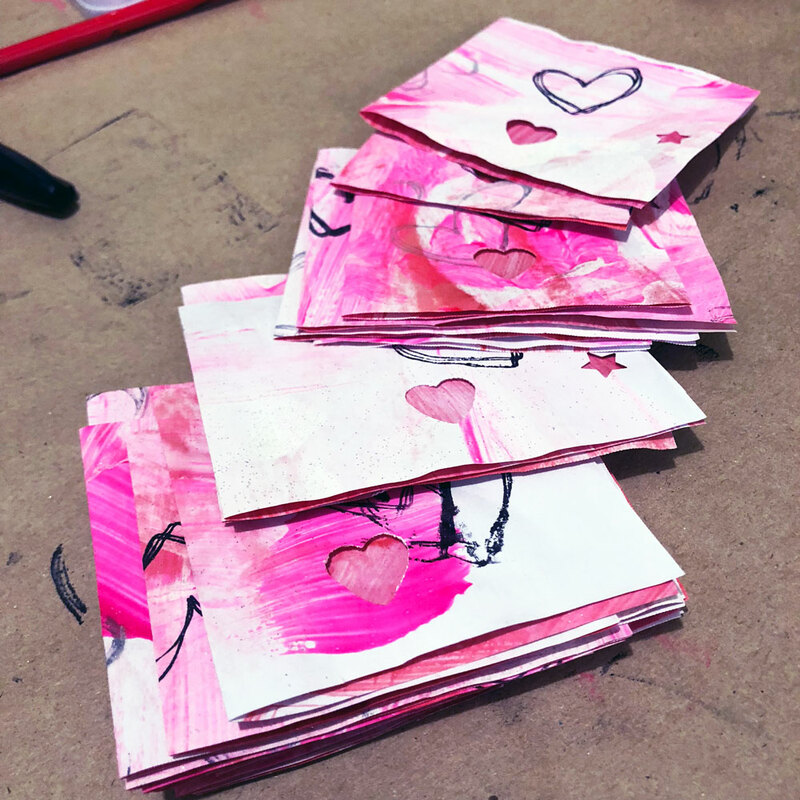 Next, I began cutting up the sheets of paper into smaller valentine size pieces. After cutting and folding them, we punched out heart and star shapes. I kept the pink and white on the outside and red on the inside so the heart cut outs would pop. 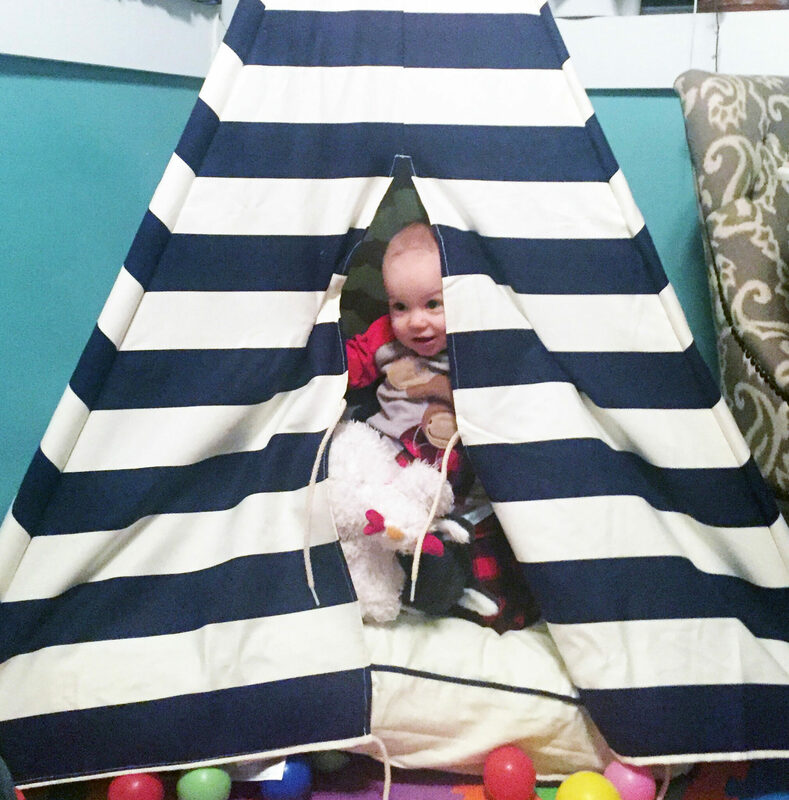 The heart puncher was very hard to push down, so I handled those, while cooper added the stars. 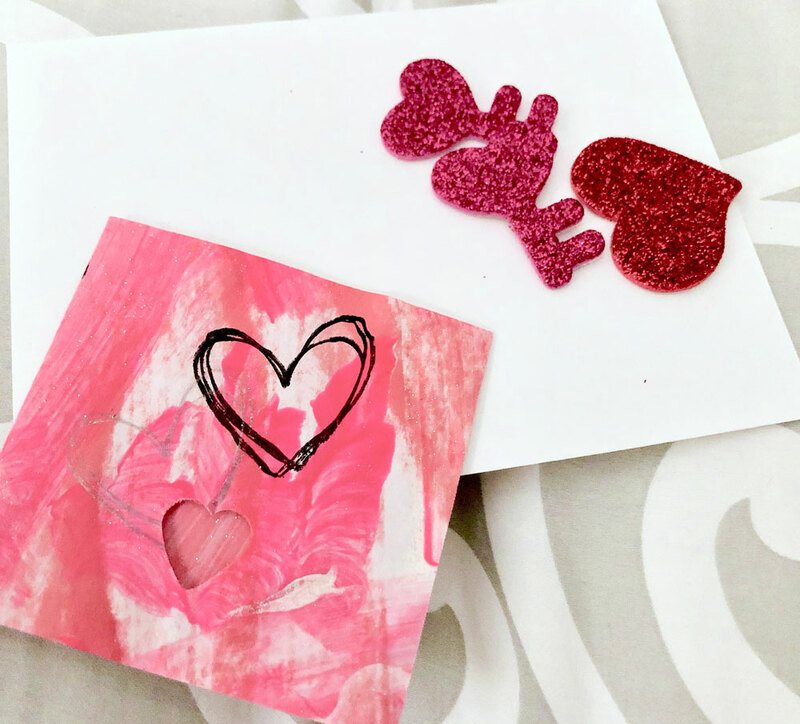 After we punched, added a few more stamps, and some colored pencil scribbles, I had Cooper put a sparkly heart sticker on the inside of each one. This year I handled the name signing. We will work on his alphabet so maybe he can sign a few next year. To finish them off we stuffed them in envelopes with a handful of sparkly, foam, Valentine themed stickers. 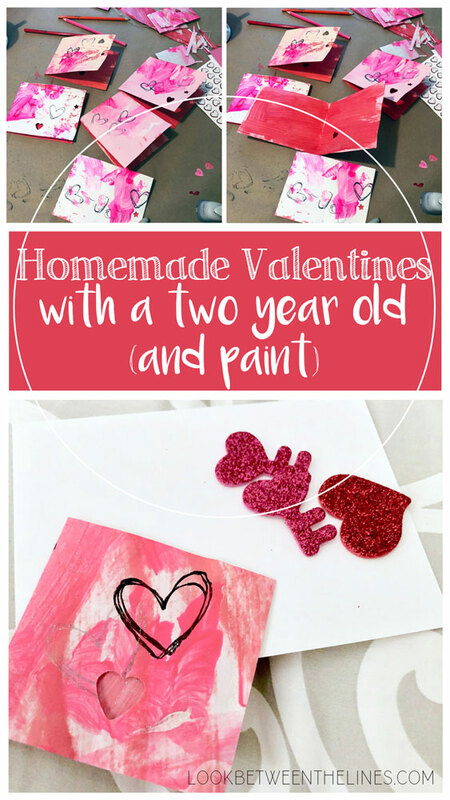 I love the homemade look of these valentines. I know this will probably be one of the only times I get the chance to do this. I’m sure Cooper will be seduced by the action heroes, minions, and other fun characters that cover the not as fun and unique valentines in the stores. Until then, I will soak up every minute of craft time with my little. I hope you enjoyed this Valentine post on Valentine’s day. Help me spread the word about crafting with littles, art, visual journals, and all things crafty by sharing it with others. Thanks for stopping by! Hands down, Christmas is my favorite time of year. Although I refuse to decorate until after Thanksgiving (each holiday needs a moment to shine), I start feeling the Christmas spirit as soon as Halloween starts approaching. This is yet another visual journal page about Christmas (check out visual journal pages about past Christmases here, here, and here), and it definitely won’t be the last. Nick and I were about to spend our third Christmas in our Atlanta, GA bungalow, and each year we got more and more serious about our Christmas decorations. Thanks partially to my Mom’s commitment to giving each of the kids a nutcracker every year for Christmas, our interior decorating game was on point. I will never forget our first Christmas together when I started unpacking no less than twenty nutcrackers and my husband of less than a year commented: “I didn’t know you had a nutcracker collection…” Five years together and you would think he would’ve known everything about me. 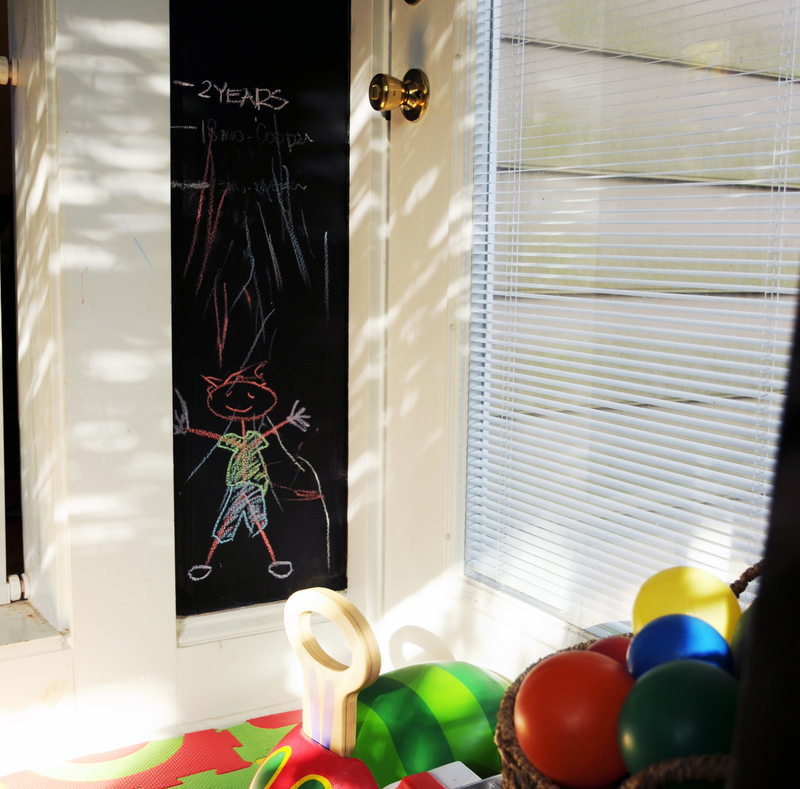 As the interior of the house filled up, we began thinking about the exterior. We had always managed to get at least get a few wreaths out and some lights on the bushes, but never attempted to add lights to the house. Our roof is incredibly steep, and even though we live in a small house, Griswalding it up was a little daunting. However, despite the risk of falling off our roof, Nick decided it was time to step up our exterior decorating game. He didn’t get out of control, we didn’t cause a neighborhood blackout (Yes, another Christmas Vacation reference). He simply lined the top and edge of the roof with the round bulb style white lights. But that little touch was enough. It brightened up our sweet house and our street. He slipped, slid, and held on for dear life as he clipped the lights on, and he got it done. It was a lot of work, but it was worth it. However, I will admit, Nick asked if we could just leave them up on the house until the following Christmas (no) after the amount of time it took. For the next month, every time I arrived home from work I couldn’t help but smile. It brightened up each afternoon and reminded me that Christmas was almost here. Compared to a lot of my other visual journal pages, this page uses very few materials. I wanted to keep it simple, to the point, and I was in the midst of a minor colored pencil obsession. So, naturally, I did a full colored pencil drawing. I started by cutting a 2 sheets of white paper to the size of my book spread (two pages facing each other). I then sketched out my house on one sheet. Next, I began layering Prisma colored pencils. When I use colored pencils I typically start dark and move light. I get at least three different hues of one color (dark, medium, light at the minimum) to layer together to create more depth. I also like to color in circles to create a softer look. Once I had the house fully filled in, I cut it out. Read more tips on using colored pencils here. Next, I began adding the background to the second sheet of white paper. I wanted a loose look around the edges, so I spread out the lines as I approached the edge of the paper. I layered many different shades of blue for the sky and green for the ground. Once it was filled in, I cut it out, making sure I cut close around the loose lines at the edge of the paper. 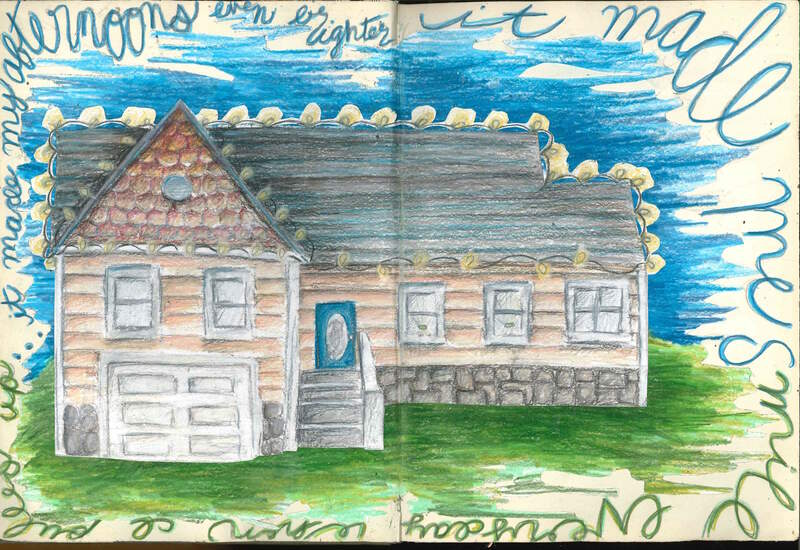 I glued the background to my visual journal first, then centered my house drawing on top. To finish the page, I added the text: “it made me smile everyday when I pulled up… it made my afternoons even brighter” using colored pencil around the edge of the drawing. I exaggerated the letters to help them blend in with the background. I also used the same blues and greens so the text blended with the sky and ground. 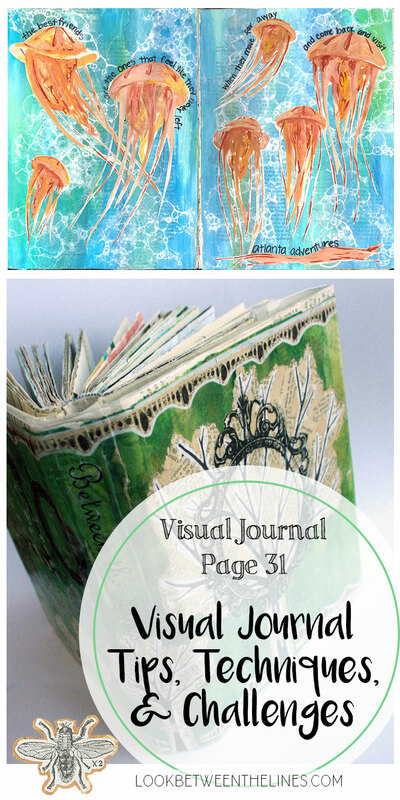 Create a visual journal page using nothing but paper and colored pencils. 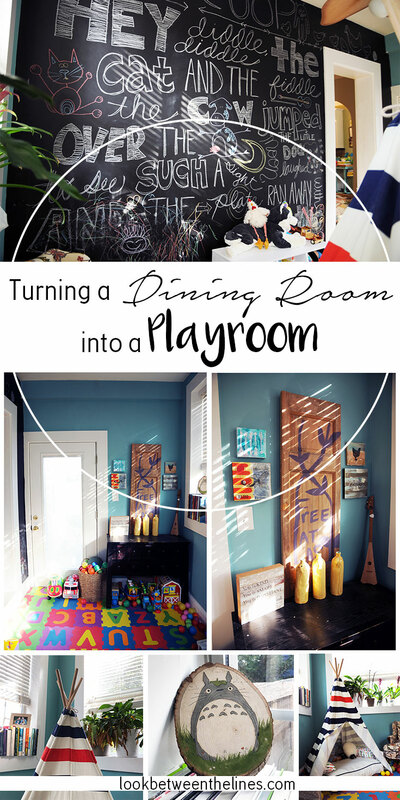 Thanks for taking the time to check out my blog! Help spread the word by sharing it with others. 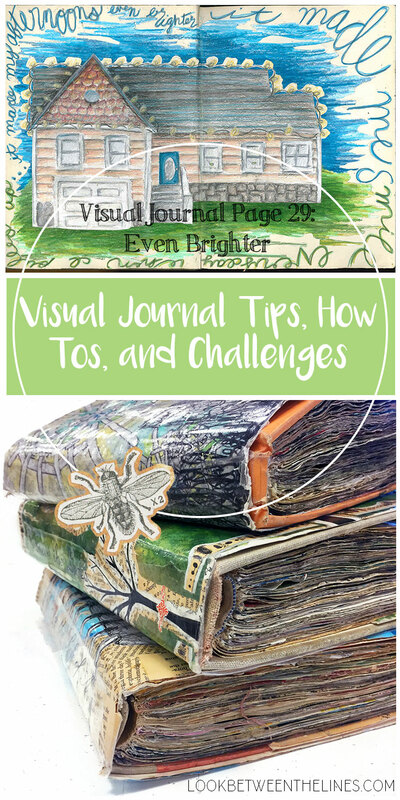 Are you interested in teaching visual journals to your students? Check out my visual journal basic lesson here and bundle pack here. Thanks for stopping by! There is something about the sound of trains. It first started on trips to visit my grandparents. They lived in a small town, it’s biggest claim to fame being their proximity to another small town, known only for their major, annual golf tournament. They were on the South Carolina side of the Georgia, South Carolina border. A place full of ya’lls and yes ma’ams. I remember driving down the small town roads, turning onto their street, finding it odd they didn’t live in a traditional neighborhood. Commercial areas transitioned into residences without the signage and dead end streets of the neighborhoods I was so accustomed to. 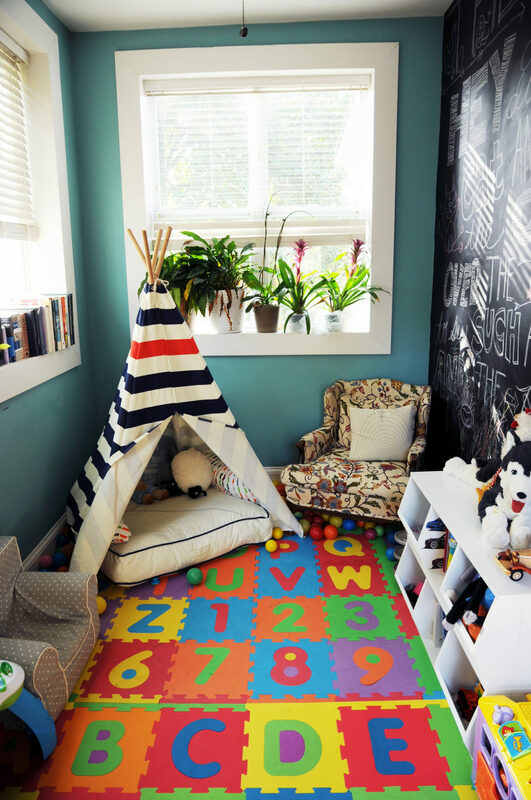 This was reminiscent of a different era, which was reflected in so many ways in their home. From the split level, ranch style house, that lived on a non-neighborhood street, to the objects it held within it’s walls. This was the house my mother grew up in, and it felt like home. I remember lying in bed, full of “grandmommy macaroni and cheese,” dreaming about the animal shaped pancakes that would surely be waiting for me the next morning, hearing a train whistle in the background. I feel asleep to that sound many times as a child and the memory traveled with me into adulthood. The funny thing about memories associated with senses is you often don’t realize they are tied together until you experience it. At twenty-three it had been years since I spent the night at my grandparents house and I had just bought my own house. 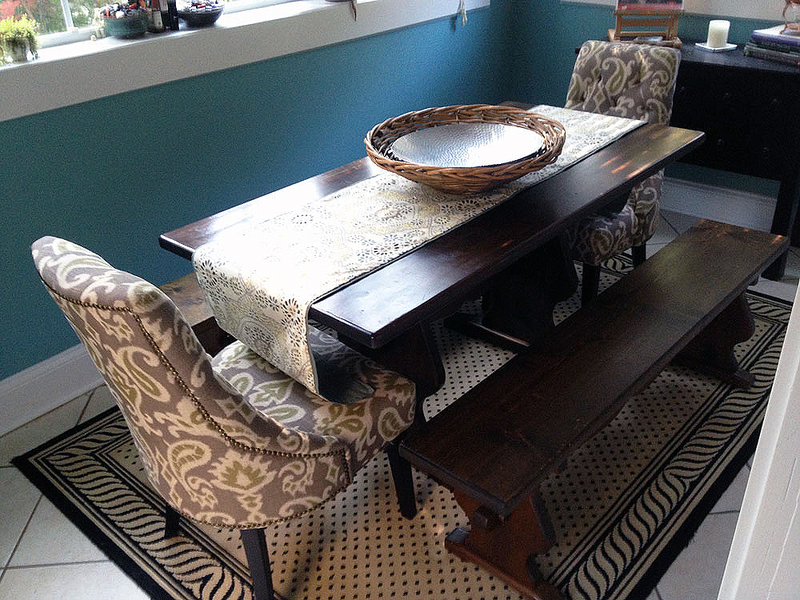 My new husband and I moved into our sweet 1940’s Atlanta bungalow our first year of marriage. 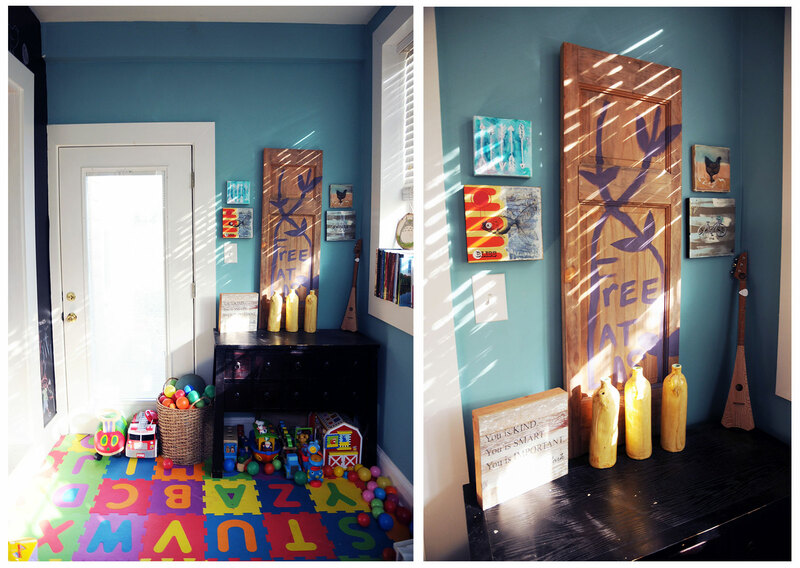 In the days and weeks that followed, we unpacked and settled in. I distinctly remember slowly drifting off to sleep one night when I suddenly heard the sound of a train. I was immediately thrust back into my grandparent’s house, sleeping next to my sister, looking out the window of the only slightly second story. My new house didn’t quite feel like home yet, but in that moment it began to. Eight years later I am still living in my adorable house, listening to train whistles, fully feeling like this is my home. My adult home, with the train whistles of my childhood, with my babies now falling asleep to the same sounds in a different town. For this visual journal page, I knew I wanted to focus on a train. After searching for an image of a train, I came up empty handed. I couldn’t find the exact angle or size that I wanted and needed to fill the two pages of the book. After brainstorming. I finally decided to paint the train myself using watercolor. I sketched out the body of the train, referencing images online to plan out the design and colors. Once I had a base sketch, I began filling it in with watercolor. I started light and slowly added in the shadows. If you go too dark too quickly with watercolor it is difficult to add highlights back in. It’s best to work light to dark and plan ahead. Once the paint dried, I cut it out. Once the train was finished I decided to create a background using magazine images. I liked the contrast between the realistic imagery and painterly train as well as the difference in the shiny texture of the magazine and the matte finish of the paper. I knew I wanted to create a color fade in the background to create a feeling of dusk. As I flipped through magazines I kept my eyes peeled for any large sections of black, dark blue, purple, yellow, and green fields and grass. Anything I thought could work, I ripped out. Once I had a sizable stack of magazine pages, I began ripping them up. I love the look of collaging with ripped pages. The soft, organic edges create a more interesting pattern than cut edges. I separated the ripped up pieces into piles according to color. Because I wanted it to look like night was pushing out day, I began layering the lightest colors first. As I moved from the middle of my visual journal page up, I overlapped the dark colors over the light colors until I had black at the top of the page. Check out a post that details the process of creating a magazine fade here and here as well as a Youtube video here. Next, I worked from the middle of the visual journal down. I used fields as the background of the landscape and worked my way forward to grassy patterns. As I glued the foreground down, I kept checking the placement of the train until it was positioned the way I wanted it. I glued the train down, than continued overlapping the grass over the bottom of the train and continued to move towards the bottom of the page. After the page was finally filled up, I added the steam coming from the train. 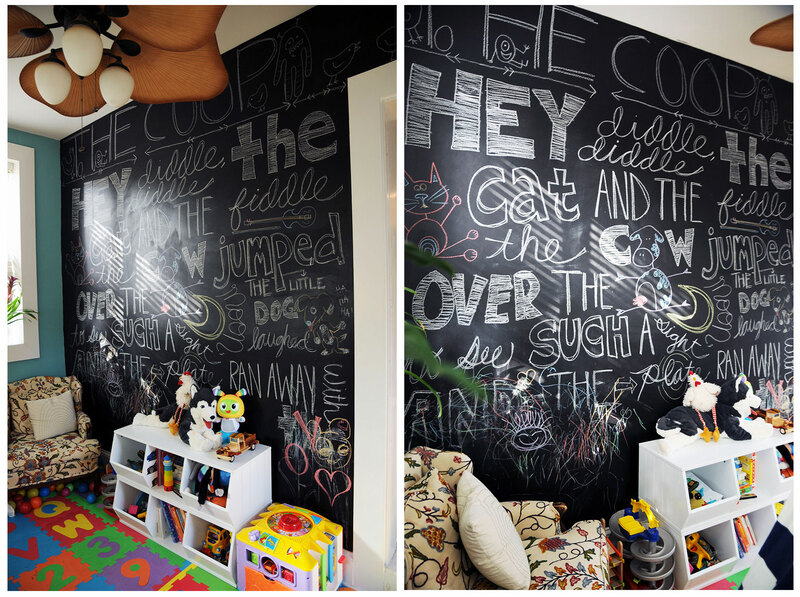 I decided this was a perfect space to incorporate text in a way that blended with the image. I used gesso and a paintbrush to loosely add the steam, then painted the letters in a similar way so they would blend in with the steam. Once the gesso dried, I used pencil to emphasize the text a little more. Create a visual journal page about a memory/sensory tie you have experienced. Thanks for taking the time to read about my visual journal and check out my blog. You can find an image of my grandmother in a recent post here. She unknowingly became the subject matter for a printmaking project. Don’t forget to save this project for later by pinning it, or saving it on your social network site of choice. Thanks for stopping by! 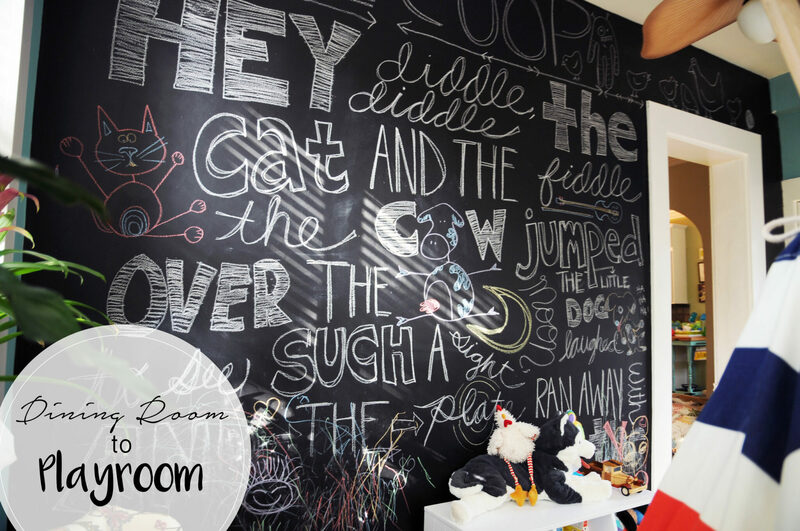 Interested in teaching a visual journal lesson in your classroom? Check out my teaching resources here and my magazine fade visual journal handout here.